For me, healthy eating is all about preparation. If I don’t have nutritious snacks at home or already packed in my bag when I go, I’m much more likely to reach for a chocolate bar. The same goes for the kids. When they are screaming for a snack mid-afternoon they are not going to wait 10 or 15 minutes for me to make something. It needs to be instant! That’s why I absolutely love energy bites. 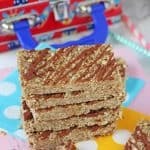 They are packed full of nutritious and filling ingredients, making them the prefect snack for adults and kids alike. 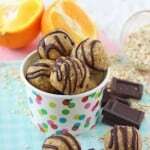 I have made lots of different versions of these over the past couple of years, including Chocolate Chia Energy Bites and Chocolate Orange Energy Bites. Today’s recipe is a new version, as I fancied something that tasted quite fresh and fruity for the new year! I’m a big fan of freeze dried raspberries as they are a great way to add lots of flavour to sweet snacks. They can be expensive to buy in small packets in the supermarket so I get large bags like this one from Amazon. It’s much more cost-effective this way and the bag lasts ages. 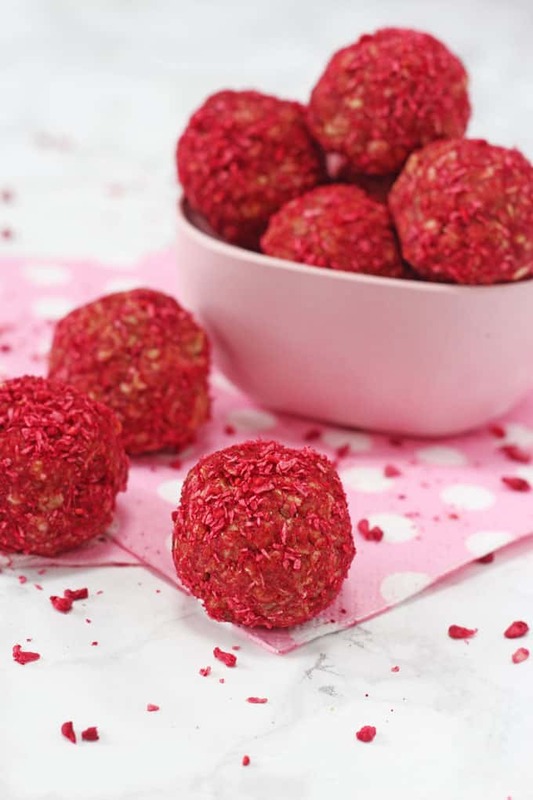 My recipe will make 12 of these energy bites and they keep in a sealed container in the fridge for up to 5 days, ready to pull out when the kids are shouting for a snack, or even to pop into your bag for a mid-afternoon snack at work or after the gym. Add all the ingredients to a large bowl and mix well. Roll into about 12 balls. In a food processor add the extra freeze dried raspberries and shredded coconut and blitz until they are fine and powder-like. 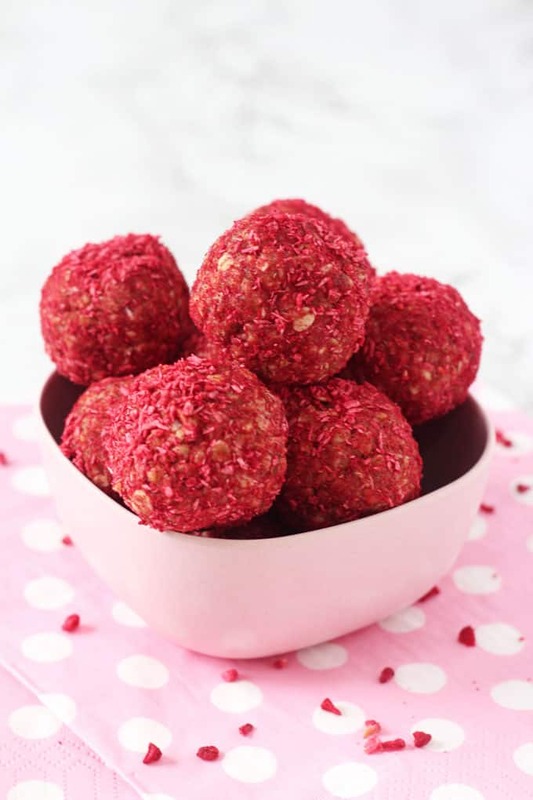 Roll the energy bites in this mixture and then transfer to the fridge to firm up for 30 minutes. Serve immediately or keep in an airtight container in the fridge for up to 5 days. Thanks for sharing! What a fun one to make with kids too! These looks so good! Does the peanut butter flavor come through much? I LOVED this recipe! But I didn’t have any raspberries, so instead, I made a nut version. I added chopped pecans, diced almonds, and maple syrup. I rolled them in shredded coconut. I found heating it before making balls help the mix keep its shape. They smell so good! Dip in butter and enjoy! 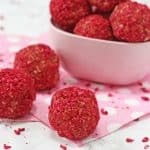 I really like how vibrant these balls are and they are really handy for on the go snacks for the kids. 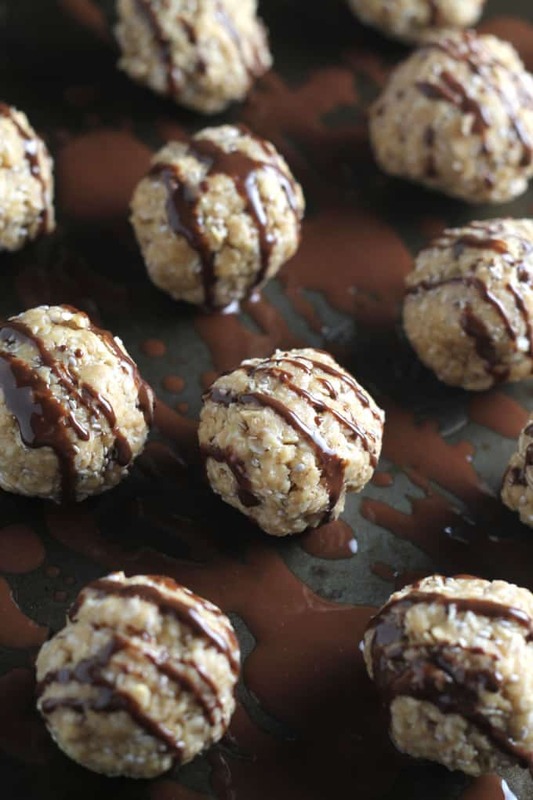 My kids love it when I make energy bites. I love this recipe. They’re so pretty! My daughter really likes freeze dried blueberries but we haven’t tried raspberries yet. I love the idea of adding them as a coating. It makes your energy bites pretty and delicious. I’m going to have to make these for my kids. 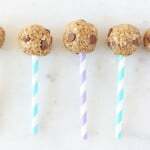 Though, I’ll make them with almond butter, one of my kids unfortunately has a peanut allergy. Thanks for the recipe! Thanks Jennifer. The raspberry coating certainly makes them really pretty! Hope you like them! Does it need to be freeze dried raspberries or can I specialise freash/fozen? Yes freeze dried as it stops the bites becoming soggy! Is there something I could substitute for the peanut butter if I have a nut allergy?